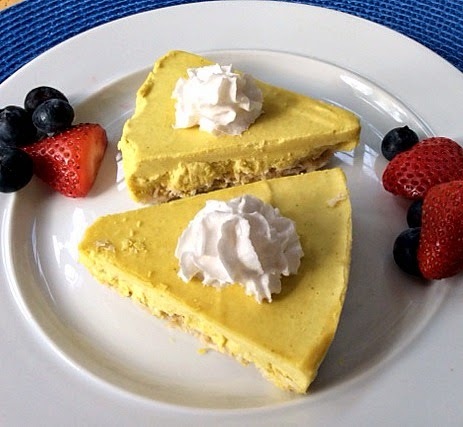 I would have to describe this GF/DF Lemon Tart as decadent, fascinating and nothing short of absolutely delicious.This recipe is the perfect combination of a mildly sweet grain free (made with almond flour) and gluten free pie crust with a rather strong lemony filling. Truthfully, you will either love it or, you will love it even more! The taste is definitely intense, but very impressive, delicious and refreshing, especially to all of you lemon lovers out there. Place coconut oil, water, honey, and salt in a Pyrex (oven safe) bowl. Place bowl in the preheated oven for 10 to 15 minutes. Allow the coconut oil to begin bubbling. The oil will begin to brown on the edges. Remove the bowl from the oven. Be careful because the bowl will be hot. Add almond flour, vanilla extract, and baking soda and stir quickly until a ball forms. Transfer dough ball to a 9-inch tart or spring pan with a removable bottom. Use your fingers to spread dough into the base and up the edges of the pan. Prick the bottom all over with the a fork. Partially bake for 7 to 10 minutes at 350 degrees. Do not fully bake the crust or it will get too brown when later baking the filled tart. Pour mixture into the prepared crust and bake at 350 degrees for 15 minutes. Pie will be solid on the top but visibly soft in the inside. Do not worry, it will set once cooled. Place in refrigerator for several hours to set. Enjoy with fruit and/or whipped coconut cream! Looks good! My cousin has these allergies and I think she would really like this! Just wondering if you have tried any other flour besides almond? Along with many allergies, my son also has histamine issues so almonds are also out of the equation, as are cashews. Could you suggest any substitutes? Thanks so much. I'm dying to get back into desserts again - its been feeling like a sweets drought for far too long! I have read ( but never tried) that you can use Sunflower Seed Flour in place of almond flour. If you're safe with that [not sure about the histamine issue], you can try it as a 1:1 substitute for almond flour. To make the sunflower seed meal/flour, simply grind them up into a fine powder in a blender/food processor/coffee grinder/mortar and pestle. I just made this for a birthday party and it was a huge hit! It tastes like a delightful lemon bar. Thank you! This is definitely something I will be making again.